The hype over shoebox property units seems to have cooled down. Sales transactions in these small private apartments have fallen by 46% in the second half of 2012. In the second half of 2012, some 1372 units were transacted compared to 2539 units in the first half of last year. Experts cited fewer launches as developers focus on building bigger units to meet demand. Still, analysts said there is always demand for such units that are generally smaller than 700sqft. Demand for shoebox units was the highest in the city area and its fringes last year and this was translated to large price increases. Data analysed by Knight Frank showed that prices of shoebox units in the city fringes or Rest of Central Region (RCR) grew eight per cent in 2012 from 2011 and those in the city up by 3.1%. However, this does not apply across the board. Shoebox units in suburban areas are less popular and their prices dipped 6.3% last year. 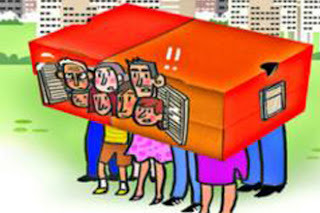 With the latest property cooling measures, experts said the tables may now turn in favour of shoebox units that are further away from the city. Their lower prices have now become an attraction to home buyers. Alice Tan, senior manager at Knight Frank Consultancy and Research, said: "The recent cooling measures would impact on price quantum per se because home buyers would be working out their sums in terms of how much cash outlay they can put forth. Given the higher price sensitivity, shoebox could still be in demand, especially those in the prime areas and city fringe areas." With property developers now focusing on building larger homes, experts said a supply shortage for shoebox units is beckoning. From November last year, the government restricted the number of shoebox units that can be built in a development in the suburbs, where the number of completed shoebox units is expected to quadruple to some 11,000 by the end of 2015. With supply now curbed, prices should also stabilise. Colin Tan, research head at Suntec-Chesterton, said: "The White Paper (on Population) may have boosted investors' confidence because people are now asking is there now oversupply or not? This may also have boosted the popularity of shoebox units. Most of the shoebox units in the suburbs have been quite close to MRT stations." Mr Tan said there will still be rental demand for shoebox units in these areas but the rental prices may not meet the owner's expectations. Analysts expect prices of shoebox units to soften by one to two per cent this year. But for the time being, prices may remain flat for at least the next six months as buyers stay on the sidelines to ascertain the effects of the cooling measures and the general direction of the world economy. No Comment to " First there's 华语cool. Now it's Shoebox cool..! "